It’s made all the boxing news this past 24 hours. Amir Khan, whom we love to put on blast at PJB, has accepted a fight against Canelo Alvarez. This comes as a total shocker to the boxing community as Amir has spent the past 3 years waiting on a Manny/Mayweather payday we all knew would never come. Recently he seemingly has refused to fight Kell Brook in the UK, which in my opinion would have been a highly lucrative fight to take. Regardless, here we are now in 2016 and Khan is about to take on one of the most fearsome boxers in the ring right now. Let’s have a quick and dirty breakdown of this fight. I’d like to separate size from weight for this fight. 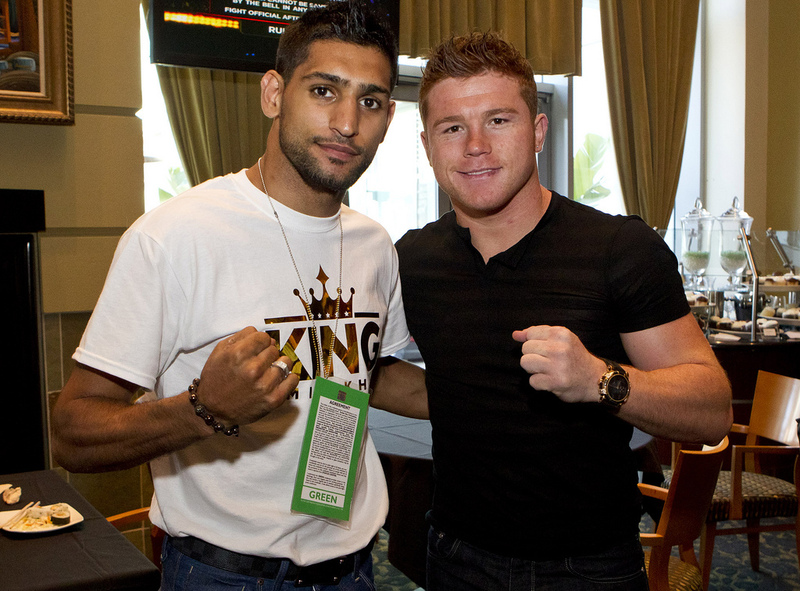 Normally they go hand in hand, but for Khan and Canelo they do not. Khan and Canelo are 1cm apart in height and Khan has the reach advantage. Size wise, they are the same. Don’t believe me? In this photo, one may assume Khan is the bigger guy. Sure he is a bit closer to the camera distorting it a bit, but really they are the same size. Typically this would equate to a similar weight, but the freakish frame of Canelo allows for him to balloon to 170. Khan is not so fortunate. In the past 3 years, Khan has fought 3 times at 147; 8 fewer pounds than he is scheduled to face of at 155 with Canelo. This poses a rather interesting narrative as the human body can put on roughly .25-.5 kilos of lean muscle a week under serious muscular training. Lets give Khan the benefit of the doubt. In 14 weeks he puts on .25 kilos a week, that is 7.7lbs; this assumes a camp of straight muscle training, which we all know is not how a training camp goes. Unless Khan has been anticipating this fight, I foresee a very difficult battle to put on proper weight in 14 weeks. Canelo in the same time frame has fought 6 times at varying weights around 155. When he fought Mayweather at 152, he came into the ring at 165. Against Trout and Angulo at 154, he came in at 172 and 174 respectively. This poses a serious risk for Khan. If Canelo can cut the in the same manner, and if Khan really does have to put on weight, Canelo could come in almost 20lbs heavier on fight night. Very bad news for a questionably chinned Khan. If the article photo didn’t explain thoroughly, Khan has a very very bad chin. He has been knocked down 6 times in 34 fights, 2 resulting in a KO. Those 2 KOs came at lightweight and super lightweight… They were not particularly savage blows, just well timed shots and in fairness, may have stumbled a stronger chin as well. But in case anyone had forgotten, Canelo was almost able to put Kirklands skull in low earth orbit with this. I don’t like making assumptions, but if a lightweight Prescott can KO you in 54 seconds, Canelo has the potential to legitimately kill you. Khan is without a doubt the better ‘pure boxer’ of the two. He is better in nearly every aspect. Footwork, speed, ring awareness, counter-punching and defense all swing in Khans favor, but he has had that advantage in virtually every fight hes taken. Fact of the matter is, his chin is so bad that a punchers chance really becomes a rather easy win condition for the opponent. Canelo has made a living of beatdowns. What he lacks in ‘pure boxing’ he makes up for in raw power and the ability to trade. Given the weight advantage he will most certainly have, Canelo will be able to bully Khan, regardless of the technique skill gap. People keep bringing up Mayweather, myself included. Yes Canelo had no answers, but he was much younger and much less experienced than he is now. Would he beat Mayweather now? Who knows. But one thing is for certain, Khan is nowhere near May’s level. I don’t think you have to respect Khan as much in the ring; he can’t pick you apart like Mayweather can. If you bully Khan, he will open up and get caught and it only needs to happen once for Canelo to have an easy KO. Khan has little to lose and much to gain in this fight. For starters, this will be a huge payday. As for win/lose; get KO’ed and we all saw that coming, but win and the boxing world will have to collectively back pedal on the Amir bashing. If he is able to pull the upset, the Mayweather comparisons and YouTube rants will have some merit and shed a whole new light on Amir’s prior 3 years of bitching. In closing, I must give respect where it is due. Khan has accepted a near unwinnable fight in 14 weeks after Ward-like inactivity. He has chosen to take on one of the best in the ring right now with zero experience at the agreed weight 8lbs heavier than he has ever fought and that takes brass balls. Verdict – May the spirit of Gatti-Ward be infused into Khan’s chin.